The first attempt at Wild Camping!! I say attempt as this wasn’t 100% successful however as all first experiences go a lot was learnt. The route started at the Rambler Inn at Edale, the kind landlady gave me permission for my friend Tim and I to park in the carpark for the two days. We arrived early evening after work and set off after a swift pint of Coke following the classic Grinds Brook route. Ascending Kinder within record time we began the tricky navigation of the Kinder Plateau. Having crossed the plateau before I was mindful of the potential navigational errors and with a combination of compass bearings and luck we arrived at Seal Stones without any issues. A quick look around and we found a fairly flat area off the path to setup camp for the night. Tents up and Wayfarers boiling away we sat admiring the views until darkness fell. The night was calm and warm with very little wind or rain. The next morning was misty but fairly warm. 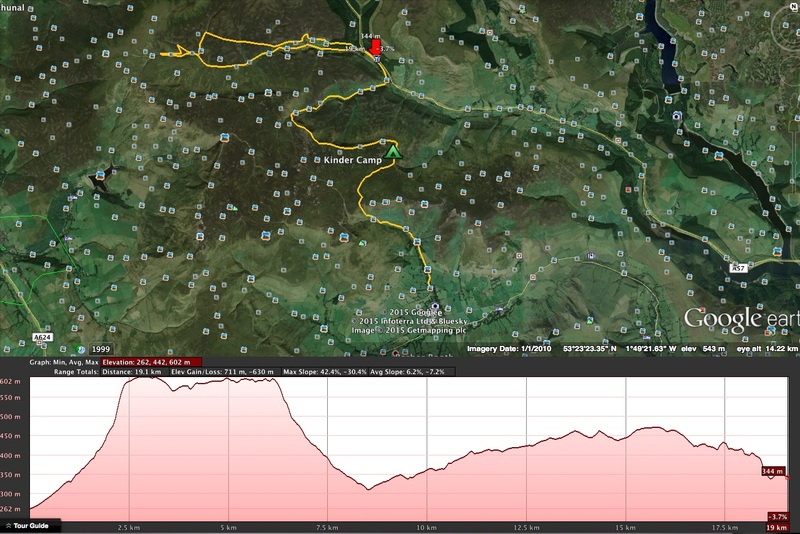 After breakfast and a few cups of hot coffee we packed tents away and started the descent to the Snake Pass. We stopped off for a pint at the Snake Inn where we met a group of lads that explained they’d attempted a Wild Camp on Bleaklow that night but had to abandon late into the night fleeing to the Snake Inn B&B! Given their recent experience of Bleaklow we discussed various route options and decided to take their advice on the best route up. Although their advice was sound, I learnt a valuable lesson, don’t ignore the map!! After finishing our drinks and waving back at our fellow wild campers we set off for Bleaklow. I’d put the map away safe in the knowledge that I’d listened carefully to the directions they’d given. Passing through some woods we followed a path which we thought would take us to Doctors Gate and on to Bleaklow. In fact rather than heading North we were heading West along Snake Path!! The sun was shining and we were pleased how well things had gone so far we walked merrily along. It wasn’t until we’d reached the far North Westerly edge of Kinder did the penny drop we weren’t where we thought we were! Along the Snake Path we’d crossed maybe 5 or 6 small streams no wider than 1 or 2 feet across. Hopping over them without any difficulty. At the point of realisation of our navigation gaff the weather turned on cue!! An almighty downpour started, the sky turned black and dark, thunder and lightening all around us. Slightly nervous about about being struck by lightning we opted to sit tight and wait for it to all blow over out before climbing higher to correct our route over to Bleaklow. Sat there for 30mins or so the rain kept coming heavy and fast! Thunder and lightning in all directions getting closer and closer. As we were somewhat trapped in the low valley of Snake Path unable to climb higher due to the risk of lightening strike we opted to retrace our steps back to the Snake Pass and rethink things from there. However, the stream (might be called Ashop Clough) that follows Snake Path had become a massive brown river of rapids. Each small stream we’d hopped over on the way had also become a foaming torrent 8-10 feet across. For 3 hours we navigated up and down the moorland trying to find safe places to cross until eventually arriving back at the A57 Snake Pass road. Completely soaked and boots full of water we retreated back to the Snake Inn feeling very lucky to be alive! After much deliberation we decided to call an end to our first wild camping adventure and called a taxi to take us back to Edale. Changed into dry clothes we had a meal in the Rambler Inn before heading home. Although this was fairly disastrous and perhaps over ambitious first wild camp many lessons were learnt which have added to the success of many subsequent wild camps. See my Wild Camp Map page for more route info. 1. Don’t ignore the map, take route advice but don’t rely on it. 3. Don’t carry too much weight…you don’t need 6litres of water or 3 sets of clothes!